About a year ago I found that the ancestry of present-day Iranians was best explained as largely a mixture between early Anatolian and Iranian farmers and Sarmatians from the Pontic-Caspian steppe (see here). Things have now changed somewhat after the release of several hundred ancient samples from across Eurasia. Below are the best qpAdm models that I was able to find for various Iranian ethnic/regional populations based on my new dataset. On a related note, there's yet another feature in the Indian media about the impending publication of ancient DNA from the Harappan burial site at Rakhigarhi (see here). I've lost count of how many articles like this I've read over the last few years. But unlike the rest, this one actually reveals some specific information about the results: no Y-haplogroup R1a and no steppe ancestry in the Harappan sample or samples. So this time, I'd say that we're only days or weeks away from the publication of the relevant paper. My final prediction in this context is that we'll see an ancient genome, or, hopefully, genomes, basically identical to the Indus_Periphery samples from Narasimhan et al. 2018 (see here). And then, apart from a few crazy people still shouting online that we need many more Harappan genomes because almost anything is yet possible, it'll be game over. During the Middle to Late Bronze Age, the steppes southeast of the Ural Mountains, in what is now Russia, were home to communities of metallurgists who buried their warriors with horses and the earliest examples of the spoked-wheel battle chariot. We don't know what they called themselves, because they didn't leave any written texts, but their archaeological culture is commonly known as Sintashta. It was named after a river near one of their main settlements; an elaborate fortified town that has also been described as an ancient metallurgical industrial center. Another of their well known settlements, very similar to Sintashta, is Arkaim, pictured below courtesy of Wikipedia. Sintashta is arguably one of the coolest ancient cultures ever discovered by archaeologists. It's also generally accepted to be the Proto-Indo-Iranian culture, and thus linguistically ancestral to a myriad of present-day peoples of Asia, including Indo-Aryans and Persians. No wonder then, that its origin, and that of its population, have been hotly debated issues. The leading hypothesis based on archaeological data is that Sintashta is largely derived from the more westerly and warlike Abashevo culture, which occupied much of the forest steppe north of the Black and Caspian Seas. 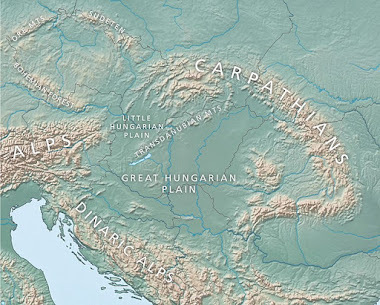 In turn, Abashevo is usually described as an eastern offshoot of the Late Neolithic Corded Ware Culture (CWC), which is generally seen as the first Indo-European archaeological culture in Northern Europe (see here). Below is a Principal Component Analysis (PCA) featuring 38 Sintashta individuals from the recent Narasimhan et al. 2018 preprint. Note that the main Sintashta cluster overlaps almost perfectly with the main CWC cluster. The relevant datasheet is available here. 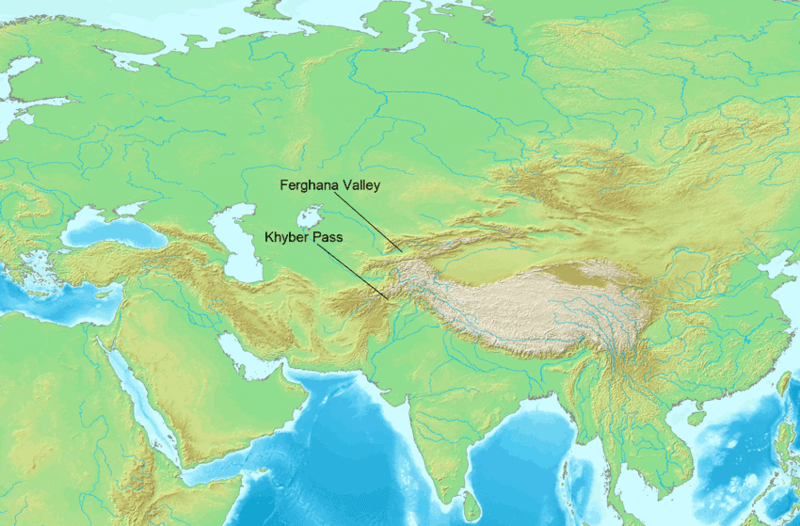 Moreover, many ancient and present-day South and Central Asians, particularly those identified with or speaking Indo-Iranian languages, appear to be strongly attracted to the main Sintashta cluster, forming an almost perfect cline between this cluster and the likely Indus Valley diaspora individuals who show no evidence of steppe ancestry. This is in line with mixture models based on formal statistics showing significant Sintashta-related ancestry in Indo-Iranian-speakers (for instance, see here), and high frequencies of Y-haplogroup R1a-Z93 in both the Sintashta and many Indo-Iranian-speaking populations. 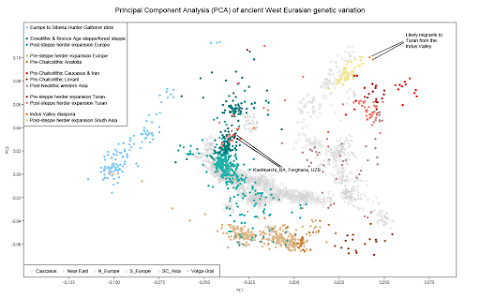 Some of the Sintashta samples are outliers from the main Sintashta cluster, and that's because they harbor elevated levels of ancestry related to the Mesolithic and Neolithic foragers of Eastern Europe and/or Western Siberia. This is especially true of a pair of individuals who belong to Y-haplogroup Q. However, this doesn't contradict archaeological data, which suggest that the Sintashta community may have been multi-cultural and multi-lingual. Indeed, it's generally accepted based on historical linguistics data that there were fairly intense contacts in North Eurasia between the speakers of Proto-Indo-Iranian, Proto-Uralic and Yeniseian languages. Thus, it appears that there's not much left to debate because ancient DNA has seemingly backed up the most widely accepted hypotheses about the origin of Sintashta and its people, and their identification mainly as Proto-Indo-Iranian-speakers. 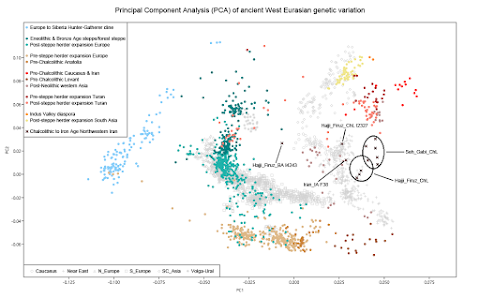 However, a sample from a Sredny Stog II culture burial on the North Pontic steppe, in what is now eastern Ukraine, has complicated matters somewhat. This individual, known as Ukraine_Eneolithic I6561, not only clusters very strongly with the most typical Sintashta samples, but also belongs to Y-haplogroup R1a-Z93. On the other hand, none of the CWC remains sequenced to date belong to this particular subclade of R1a (although, obviously, they do belong to a host of near and far related R1a subclades). 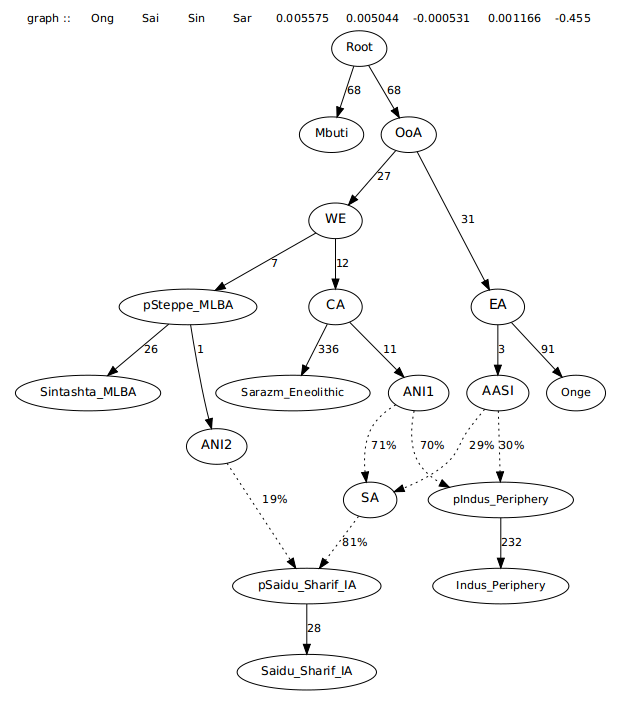 I've never seen anyone worth reading propose that Sintashta might derive from Sredny Stog II instead of Abashevo. And no wonder, because Sredny Stog II was long gone when Sintashta appeared in the archaeological record. 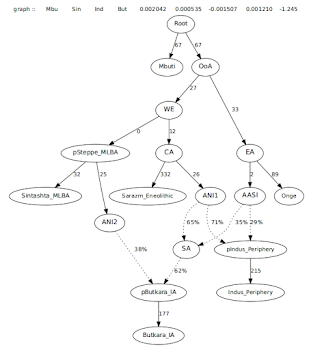 However, if CWC remains continue to fail to produce R1a-Z93, while, at the same time, the steppes of eastern Ukraine and surrounds are shown to be a hotbed of R1a-Z93 from the Sredny Stog to the Sintashta periods, which I think is possible, then ancient DNA might well force a serious re-examination of how the awesome Sintashta culture and people came to be. Despite being stratigraphically dated to 5900-5500 BCE (ie. the Chalcolithic period), ancient sample Hajji_Firuz_ChL I2327 from Narasimhan et al. 2018, belongs to Y-haplogroup R1b-Z2103 and shows minor, but unambiguous, Yamnaya-related ancestry on the autosomes. Why is this a problem? Because both R1b-Z2103 and the Yamnaya culture are dated to the Bronze Age, and Yamnaya samples from Kalmykia and Samara regions of what is now western Russia are exceptionally rich in R1b-Z2103. Thus, pending a successful radiocarbon (C14) dating analysis, it seems unlikely that Hajji_Firuz_ChL I2327 was alive during the Chalcolithic. Rather, it appears that he's partly of Yamnaya or closely related origin and has been wrongly dated. His remains are likely to be from a secondary burial from the Bronze Age that collapsed into the layer below, right into a Chalcolithic bin ossuary burial full of much older bones. - Hajji_Firuz_BA I4243 (also from Narasimhan et al. 2018 and from the same site as Hajji_Firuz_ChL I2327) was initially also stratigraphically dated to the Chalcolithic, but is now labeled as a Bronze Age sample after a radiocarbon (C14) analysis of the remains revealed a date of 2465-2286 calBCE. Moreover, this individual packs around 50% Yamnaya-related ancestry. - Iran_IA F38 (from Broushaki et al. 2016) from an Iron Age burial at Tepe Hasanlu, which is just a few miles from Hajji Firuz, also belongs to Y-haplogroup R1b-Z2103 and harbors some sort of steppe ancestry on the autosomes (see here). 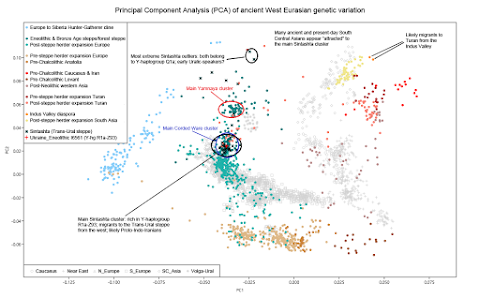 Below is a Principal Component Analysis (PCA) showing how this trio compare in terms of genome-wide ancestry to C14-dated Chalcolithic samples from Hajji Firuz and the nearby Seh Gabi. The relevant datasheet is available here. Clearly, they're shifted "north" relative to the C14-dated Chalcolithic samples and thus closer to the ancient Eastern Europeans, suggesting that they carry ancestry from north of the Caucasus that was missing, or at least much less pronounced, in the region before the Bronze Age. I used D-stats of the form D(Outgroup,Pop1)(Pop2,X), in which Pop1 are Eastern European Hunter-Gatherers (EHG) and Pop2 the C14-dated Chalcolithic samples, to test this more directly. 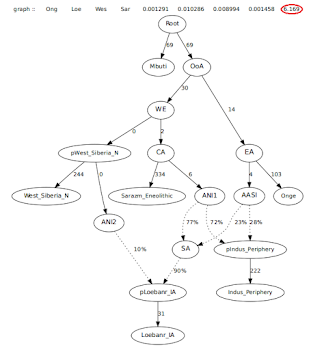 And indeed, the D-stats showed that Hajji_Firuz_ChL I2327 and Hajji_Firuz_BA I4243 shared significantly more alleles with EHG than the Chalcolithic samples did (Z≥3). 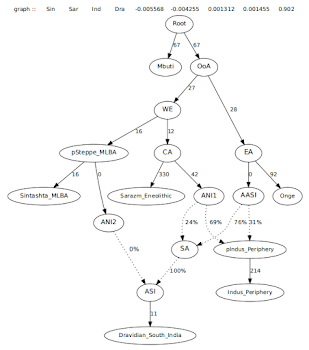 To further elucidate this EHG-related signal, I ran a series of mixture models with the qpAdm software. Below are among the statistically most successful models that I could find for Hajji_Firuz_ChL I2327, Hajji_Firuz_BA I4243 and Hajji_Firuz_ChL. Note that each of these models features Yamnaya from Samara as the proxy for the northern, EHG-related ancestry. Yamnaya_Samara-related admixture appears in all of the models. But considering the standard errors, the Yamnaya_Samara-related ancestry proportion for Hajji_Firuz_ChL is very close to zero. 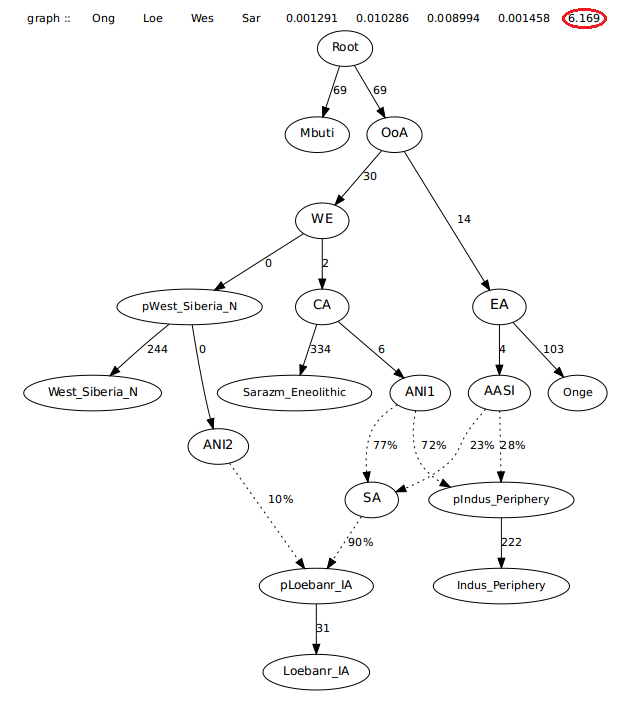 Moreover, importantly, Hajji_Firuz_ChL can be modeled successfully without any such ancestry, while Hajji_Firuz_ChL I2327 and Hajji_Firuz_BA I4243 can't (refer to the full output files for the details). I also tested whether ancient samples from what is now Armenia might make better proxies than Yamnaya for the northern ancestry harbored by Hajji_Firuz_ChL I2327. That's a negative (see here and here). 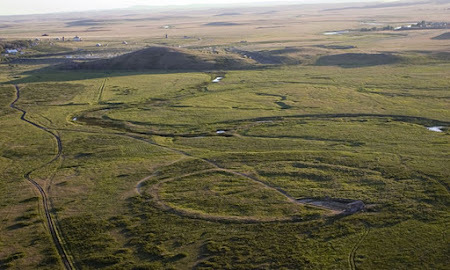 Most arguments for an Indo-European invasion from the northeast concern the appearance of a new burial rite at the end of the fourth and through the third millennium BC. At that time, both north of the Black Sea and the Caucasus, burials on the Russian-Ukrainian steppe were typically placed in an underground shaft and covered with a mound (kurgan in Russian). Before 3000 BC there begin to appear in the territory of the indigenous Transcaucasian (Kuro-Araxes) culture somewhat similar burials such as the royal tomb of Uch-Tepe on the Milska steppe. As tumulus burials are previously unknown in this region, some would explain their appearance by an intrusion of steppe pastoralists who migrated through the Caucasus and subjugated the local Early Bronze Age culture. More importantly, a status burial inserted into a mound at the site of Korucu Tepe in eastern Anatolia has been compared with somewhat similar burials both in the Caucasus and the Russian steppe. The discovery of horse bones on several sites of east Anatolia such as Norsun Tepe and Tepecik are seen to confirm a steppe intrusion since, as mentioned earlier, the horse, long known in the Ukraine and south Russia, is not attested in Anatolia prior to the Bronze Age. Another option, however, is that they belonged to some other extinct Indo-European group, such as the Gutians (see here). In any case, keep an eye out for more Bronze Age samples from this part of the world. I have a strong feeling that, unlike their Neolithic and Chalcolithic predecessors, they will be rich in steppe ancestry and R1b-Z2103. I've updated my Global25 datasheets with the samples from the Narasimhan et al. 2018 preprint (look for these labels). Feel free to use this output for anything you like, and please show us the results in the comments below. Also, here's my Principal Component Analysis (PCA) of ancient West Eurasia featuring most of the new samples. Note the cline made up of ancient and present-day South Asians running from the likely Indus Valley diaspora individuals (from the Gonur Tepe and Shahr-i Sokhta archaeological sites, in present-day Turkmenistan and Iran, respectively) towards the Bronze Age steppe. The relevant datasheet is available here. An alternative and intriguing hypothesis is instead supported by significant archaeological and textual data from comparable socio-economic or geographical contexts, which suggest that the likely high commercial and ideological value of ivory and of the expertise required to carve it made also possible and economically profitable the presence in Central Asia of independent itinerant ivory carvers native to or trained in the Indus Valley. These itinerant artisans might have provided at the same time both the raw material and the unique skills to transform it into finished objects. Moreover, the existence of itinerant ivory workers in ancient South Asia is also described in a few literary sources. The Guttila Jātaka mentions a group of ivory carvers who traveled from Benares to Ujjain to offer their products and skills to the local elites (Pal, 1978: 46), while a Buddhist Sanskrit Vinaya tells the story of an Indian master ivory carver who traveled “up to the land of the Yavanas”, most likely the Hellenistic Bactria, to put his superior expertise at the service of a renown local artist (Dwivedi, 1976: 19).